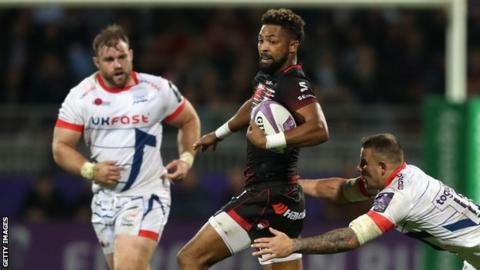 Sale Sharks surrendered a 14-point lead as they were beaten by Top 14 leaders Lyon in the European Challenge Cup. Sharks, who drew with Toulouse in their opening Pool 2 tie, held a 14-10 half-time advantage at Stade de Gerland, with wing Denny Solomona and Sam James exchanging tries with Delon Armitage. Sale were 24-10 up with 15 minutes left after James crossed for a second time. But Liam Gill and Theo Belan made it 24-24, before Frederic Michalak's late penalty completed the turnaround. The result means that, despite having led in the closing stages against French opposition for two weeks running, the Premiership club have only three points from their first two European matches. After James put Sale ahead against Lyon, England wing Solomona continued his fine form with a seventh try in eight games this season. But Steve Diamond's team wilted in the final moments and were undone by Michalak's kick with five minutes remaining. Lyon: Menini, Lacombe, Papidze, Lambey, Oosthuizen, Puricelli, Tuifua, Gill, Pelissie, Beauxis, Palisson, Seguret, Belan, Tuva, Armitage. Replacements: Fourie, Mataradze, Kaabeche, Roodt, Bruni, Regard, Wulf, Michalak. Sale: Haley, Solomona, James, Jennings, Charnley, O'Connor, de Klerk, Harrison, Webber, John, Evans, Ostrikov, Neild, B Curry, Moore. Replacements: Jones, Flynn, Tarus, Nott, Pearce, Seymour, Cliff, Reed.